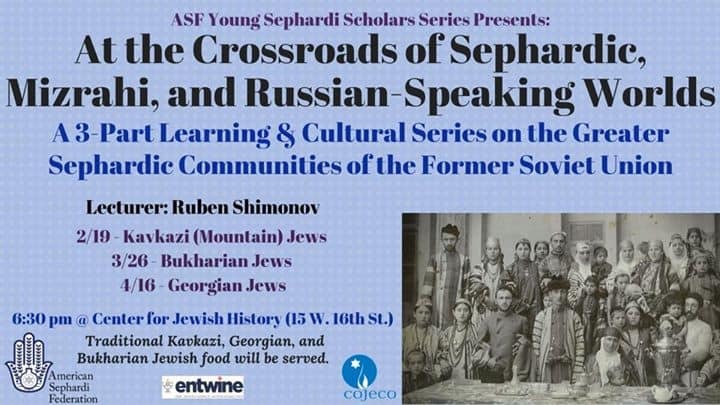 Back by popular demand, the American Sephardi Federation, in partnership with its young professionals division ASF Young Leaders, is excited to have Ruben Shimonov teach a 3-part learning series on the Greater Sephardic communities of the Former Soviet Union. The cultures and histories of Bukharian, Georgian, and Kavkazi (Mountain) Jews are situated at the fascinating, yet lesser known, intersection of Sephardic, Mizrahi, and Russian-speaking Jewish life. This interactive, multimedia lecture series will provide a unique opportunity to explore the rich and dynamic stories of the three communities. Traditional kosher Kavkazi, Georgian, and Bukharian Jewish food will be served. This program is being sponsored in partnership with JDC Entwine’s Community Representatives program, and was originally created as part of the COJECO BluePrint Fellowship, supported by COJECO and Genesis Philanthropy Group.